Counseling Under the Cross Releases Today! 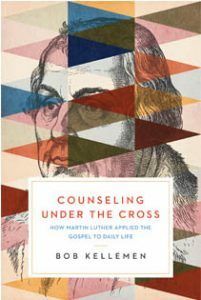 Today, September 11, 2017, is the official release date by New Growth Press of my latest book, Counseling Under the Cross: How Martin Luther Applied the Gospel to Daily Life. Martin Luther not only reformed theology; his understanding of the gospel reformed daily Christian living, biblical counseling, pastoral counseling, one-another ministry, and soul care. Through Counseling Under the Cross, learn how Luther richly, relevantly, robustly, and relationally applied the gospel to suffering, sin, sanctification, and our search for peace with God. Through lively vignettes, real-life stories, and direct quotes from Luther, you will be equipped to apply the gospel to yourself and others—finding hope and help in Christ alone. Counseling Under the Cross guides pastors, counselors, lay leaders, and friends toward a rich understanding of the gospel that will directly impact their personal ministry to others. Read Endorsements for Counseling Under the Cross. You can purchase an autographed copy of Counseling Under the Cross on sale at 25% off for just $14.99 at the RPM Bookstore. https://www.facebook.com/plugins/like.php?href=http%3A%2F%2Fwww.rpmministries.org%2F2017%2F09%2F14-free-resources-counseling-cross%2F&layout=standard&show_faces=true&width=450&action=like&font=arial&colorscheme=lightThe post 14 Free Resources for Counseling Under the Cross appeared first on RPM Ministries.